If you suffer from chronic pain, then you know how vital it is to get relief from your worst symptoms. Although there are a few different treatment options, one of the most effective is using a TENS system. By hooking low-level electrodes to your body, you can manage your pain quickly and simply, without having to go to the doctor or clinic to get relief. At first, you may think that such a system would be complicated or expensive, but the fact is that you can find affordable options like the TENS 7000 model. Let’s see how this system can reduce your overall pain without making things too complex in the process. Everyone is different, and this goes for all systems in the body, including those that regulate pain. As such, you want to be able to adjust your TENS unit to meet your individual needs. Fortunately, tens unit 7000 makes it easy to do this by offering five different program options. Here is a brief overview of what you can expect. Switching back and forth between the different modes is simple, thanks to the easy-to-use menu screen and navigation buttons. The large LED display is easy to read and allows you to see what levels you have going at any given time. When it comes to pain management, TENS 7000 makes your life simpler. If you’ve never used a TENS system before, then you may be wondering how you can get started. Fortunately, the manufacturer has created a comprehensive and easy to follow guide to help you on your first try. Even if you have used TENS before, it’s helpful to have this resource at your disposal so that you can figure out the best treatment method for your pain. The guide shows you how to connect everything, as well as how to place the electrodes for maximum effectiveness. Fortunately, you don’t need gel or any adhesive materials to get them onto your body; this system is all-inclusive. Also, the guide will go over the various treatment options available so that you can find the right one for your needs. For many pain sufferers, the only way to get adequate treatment for their symptoms is to see a doctor. At first, you may think that such an affordable and easy-to-use system can’t be the same quality as the one at the clinic, but you’d be wrong. The TENS 7000 machine is made of the same materials and components as any that you would find at the doctor’s office. The wires and electrodes are high-quality, and the machine itself is built to last. Even though it runs on a standard 9-volt battery, it can operate as well as anything else you may experience in your quest for reliable pain relief. What we like about the TENS 7000 unit is that it will provide the same results in the comfort of your own home. It doesn’t take a master’s degree to get it started, and the materials are going to last for years, enabling you to get the relief you deserve without worrying about a broken or underperforming machine. As we mentioned, everyone is different. As such, you want a system that can be customized to fit your body type and your level of pain. Although the five program modes can help you get the results you need, there are other ways to adjust the tens 7000 recommended settingsto fit your individual requirements. First, this is a dual-channel system. This means that you can use either two or four nodes, depending on the number of areas affected and the amount of pain you experience. Secondly, you can adjust the current on each set of nodes, which enables you to customize your relief even further. For example, if you experience worse symptoms in your back and mild pain in your arms, you can customize each node so that you get more electricity where you need it the most. Another excellent reason to invest in the TENS 7000 system is that you can set it and forget it. With an integrated timer that lasts up to 60 minutes, you can ensure that you get the results you want for as long as you need. Whether it’s 10 minutes three times a day, or 30 minutes twice a day, you can set your timer ahead of time and reap the benefits without having to watch the clock. For your help, you give a video – how to use TENS 7000 2nd Edition Digital TENS Unit in your backside. This unit providing immediate and lasting drug-free pain muscle pain relief from back pain. Do I need to use adhesive gel with these electrodes? You can, but it is not necessary. That being said, adhesive gel always helps get a better connection, so it may be worth it to buy some. How long does the battery last? Is it rechargeable? You can use a standard 9-volt battery, but it’s not rechargeable. Typically speaking, the unit will last up to 48 hours total before quitting on you. How easy is it to replace wires and electrodes? It’s relatively simple. Just contact the company and let them know what you need. You can also swap out for different wires; be sure to check the compatibility, though. 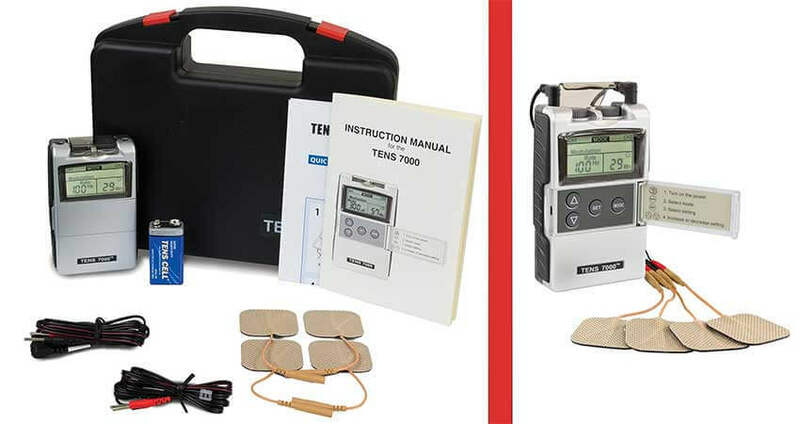 When it comes to pain relief, the TENS 7000 system is one of the best machines out there. Whether you suffer from severe chronic pain or you only need mild relief on occasion, this unit can help you significantly. We appreciate how easy it is to use, and we love how well it’s built. Simply put, you no longer have to go to the doctor or the clinic to seek the relief you need. With the TENS 7000 system, you can manage your pain from the comfort of your own home.